Junichi Suzuki’s documentary “MIS: Human Secret Weapon” will be shown on Saturday, May 25, at 12 and 2 p.m. at the Japanese American National Museum, 100 N. Central Ave. in Little Tokyo. 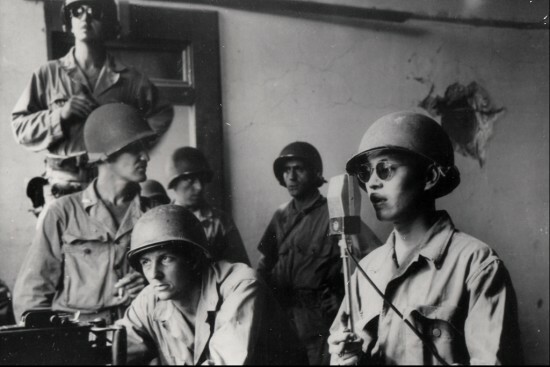 Composed of Japanese American soldiers who were trained as linguists, the Military Intelligence Service was essential in helping the U.S. achieve victory in the Pacific Theater during World War II. Many of the soldiers fighting and translating on the frontlines were Nisei who had previously been incarcerated with their families in U.S. concentration camps. Q&A with MIS veteran Hitoshi Sameshima will follow the 2 p.m. screening. DVDs of all three films are available at the Museum Store. The screening is conjunction with the exhibition “American Heroes: Japanese American World War II Nisei Soldiers and the Congressional Gold Medal,” which ends June 9. For more information on the museum, visit www.janm.org. For more information on the film, visit http://mis-film.com/.